In order to cover this entire mission, we had to travel about 45.000 km, on 13 flights, for about 60 hours in the air, totaling more than 25 hours in transit. One could think how exhausting all this is, but the Grace of God accompanied Vassula to arrive fresh and filled with enthusiasm in every city to share her testimony. The amazing thing is that she has been doing this for more than 26 years tirelessly, without ever stopping or complaining; instead, she witnesses every time with power, given to her from above and with the same fervor. Glory be to God for the gift of His Messages that are for us and for all mankind. We arrived in Australia around noon, local time, after a long trip of more than 24 hours. The Australians received us in a very warm manner. 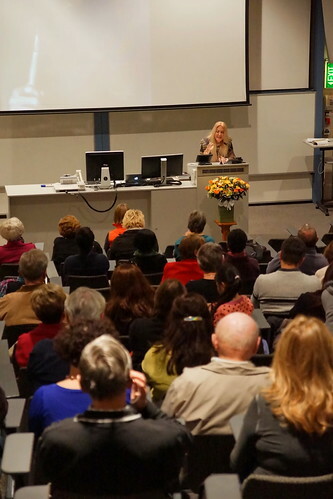 Suzy Vardanian, one of the organizers, together with several friends of TLIG in Sydney, was present to welcome us. Suzy is also an apostle of TLIG and has been one for many years. She has known Vassula for more than 20 years and together with her late husband, Avo, had been hard workers and promoters of the Messages, at one time even printing the books. Their house has turned into a sort of chapel for their local TLIG prayer group. After we settled into the hotel, we all met for dinner and discussed the last details of the upcoming meeting. Afterwards, Vassula was asked to give an interview on the Tsiatsan Armenian Radio to inform listeners about who she is and about the messages of True Life in God. 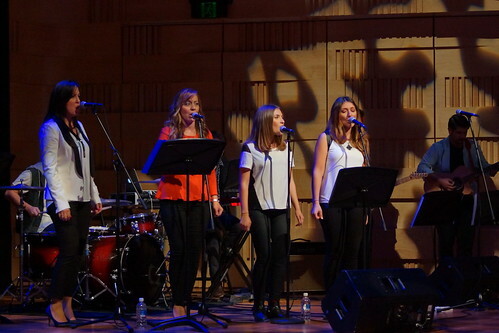 The radio interview was also intended to let its listeners know about Vassula’s witnessing at The Concourse in Chatswood, so as to give the listeners a chance to attend. Vassula was asked by the interviewer about her special gift from God and about her current and previous trips to Australia. Vassula spoke about her mission to spread the messages throughout the world, about the relevance and importance of God's Message to us and why he has chosen this way to deliver them. Having known about Vassula and the messages of True Life in God for over a decade now, it is always refreshing to hear her speak about the True Life in God Messages. It reminds me, and potentially others, of the gravity and importance of this mission. The Messages direct online via internet. Despite some morning rain, the day seemed promising! A quick visit to the theatre around noon ensured us that everything was in place for the evening program. From 5:30 pm and onwards, people began to arrive! 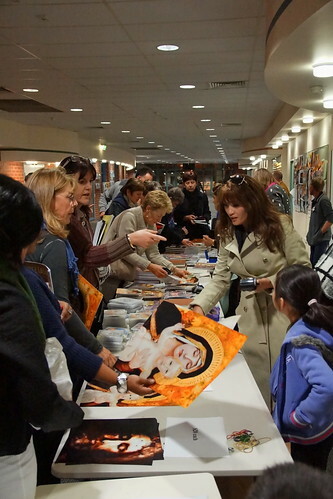 At the entrance of the theatre was a long stand with TLIG material available for people to buy; all proceeds are for the Beth Myriam Fund. At 7:00 pm, Shane introduced TLIG and its pro bono character, followed by Terry introducing Vassula and her mission to the eager audience. Angel Voices, hymns of praise. After some beautiful hymns of praise, Vassula was invited on stage. Filled with joy and making everybody fill at ease, she began to unfold her story with Jesus during these 28 years of mission! 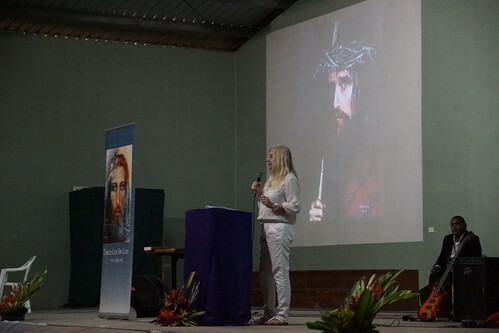 After starting her witness talk by praying the Our Father along with the audience, Vassula talked about the beginning of her communication with the divine, about abandonment – purification – repentance – God’s intimate Love – the Unification of the Church - forgiveness – and reconciliation. Vassula covered a lot of themes from the Messages, without neglecting to speak about the power and the gifts of the Holy Spirit. By this moment, her speech had roused the­­­­­ audience to pay full attention when she was quoting the words of Christ from the Messages. 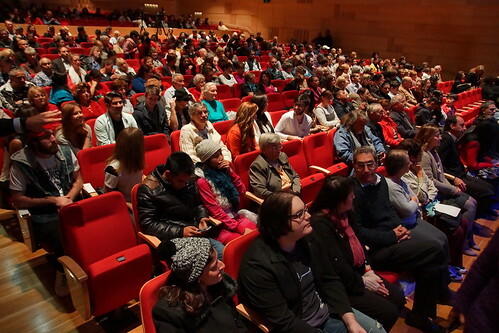 For almost two hours, Vassula held the undivided attention of all 600 people in the auditorium, moving them deeply. The day began with an interview for the Al Horeya (freedom TV) television station, an Egyptian Channel that broadcasts from USA. The interview went very well and now and then, the interviewer, Elaine, was asking Vassula questions in Arabic to which she was responding, also in Arabic. During the interview, Vassula referred to our Lady, saying how Egypt protected and nourished the Holy Family during the years of persecution from Herod. Thus God has a special love for this country. Once the interview was over, the organizers had arranged for us to visit the city of Sydney. The day ended with a farewell dinner in front of the enormous Opera House. As Vassula and I had to wake up at 5:00am the next morning, our time together with the TLIG Sydney group had to be short. Due to our next day departure, everyone was very emotional, yet happy that they had Vassula there with them once again. The group that followed Vassula to her next stop in Melbourne was comprised of: Suzy, Shane, Terry and Achilles. 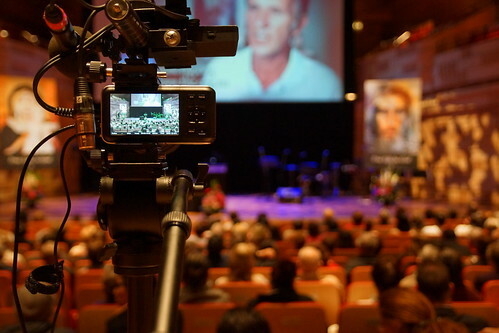 The family of John Sieff, Elaine and their son Daniel followed by car, as they were carrying all the video recording equipment for the meeting. 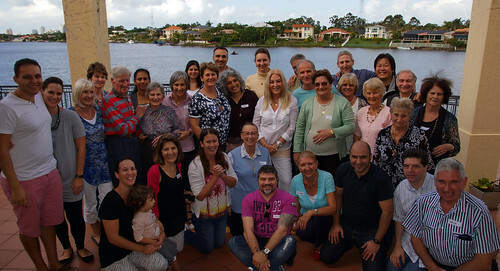 Catherine Gashi, organizer of TLIG Melbourne, together with the rest of the local team welcomed us. Everything was ready for the evening program; all was perfectly organized to the slightest detail. 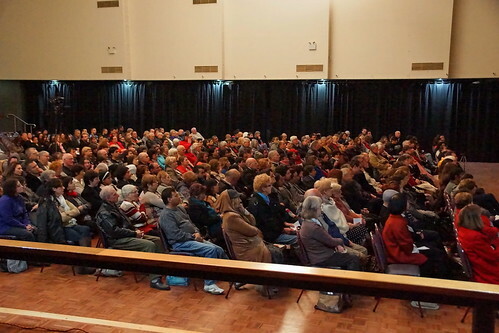 The hall was full, approx. 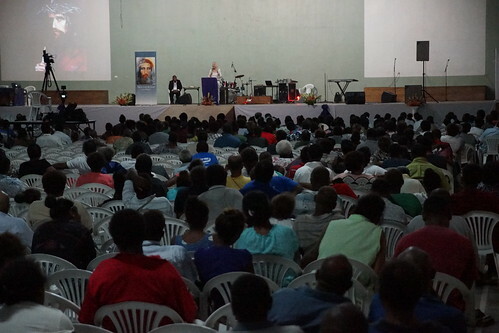 700 persons – praise be the Lord! For many of them, it was their first time to hear Vassula, having heard about the messages only recently! Praise the Lord again for this grace! In this meeting, knowing that in the hall were many beginners and people who had never heard her speak or knew very little of the Messages, Vassula focused especially on the beginning of her mission, the conversation with her Guardian Angel, God the Father and Jesus Christ. She spoke about intimacy with God and the unceasing prayer, explaining that to have God in our minds during the day and while doing our chores with Him is the “we, us” that Jesus taught her: the unceasing prayer. The meeting ended with a prayer and after that, most of the new comers rushed to get the books with the messages, so as to read for themselves the words of our Lord. At the end of our day, after having a light dinner we returned to the hotel to prepare for the next stop: Canberra. We arrived in Canberra early afternoon. The group received us with a lot of joy. At the hotel lobby, the organizing group met with Vassula for the last details of the witness talk and to coordinate the tickets for the upcoming flights. After lunch, we left for the Australian National University where the meeting would take place. At 5:00pm, Vassula began talking about how the Lord teaches us in steps to arrive to higher levels of spirituality, an ascetic sort of spirituality, and that the Messages should be read from the beginning. Vassula covered almost all the same topics which she normally covers at her witness talks. The meeting closed with Vassula praying for healing. We arrived early morning in Brisbane. The weather was very pleasant as it is at this time of the year. The local group welcomed us and we all drove in the mini bus to the hotel, singing and praising the Lord. After a short rest, we drove to the hall for Vassula’s meeting. In the hall were more than 400 people. After the introduction, a wonderfully big youth choir sang hymns and praises to God for nearly half an hour. Some of them were from other islands of the Pacific. They sang beautifully. Once more, Vassula addressed the audience sharing the messages of our Lord with new people, serving our Lord in that way. It reminded me of a message that Jesus gave her at the very beginning when He said to her: “be My net!” Indeed this was what she was doing. Yes, all of us can be turned into a Net to catch souls and bring them to the King of Kings! As we were leaving the venue, we were informed that a lady, who was in the auditorium listening, had brought as well her son, a twenty year old young man, who had a problem. As Vassula was preparing herself to depart from the venue, the lady was calling out to her for help from the balcony of the theatre. Vassula did not hear her because the choir was singing. And so we left. While driving away, Elaine told Vassula that the lady’s son, whom she knew, had a major problem. It was either psychological or it could have been a possession. When Vassula was praying and asking everyone to pray together the deliverance prayer, the young man reacted, fell on the ground and went into a bizarre twitching of his body, growling like an animal as though in pain. Elaine begged Vassula to do something about it. Vassula said that the boy should go to a priest, an exorcist and see what he has. Elaine said that the family had taken the boy to an exorcist and he said that the boy has no evil spirit. Vassula felt sorry for the mother and in the end accepted to go see the boy, even though that meant us taking a long trip of an hour or more. Nonetheless, after giving it a thought, Vassula accepted the invitation to go to them. This day was a sort of a relaxing day. We left around 10am for the Gold Coast at Suzy Vardanian’s house, where she had invited her prayer group and others to gather with us to pray. Together, we were about 40 people in total. Suzy’s house makes one feel at ease immediately. It is in a nice location by a river. Once we all gathered, we prayed the Rosary followed by a praise and worship time, inspiring everyone in that large sitting room. That sitting room looks more like a Church than what it was really meant for. Suzy has many religious statues, icons, pictures etc. and most of them are shedding oil and escarchas. Escarchas can be called in plain language, glitter. The glitter is in many colors. It is a phenomenon or, if you want, a sign from above that God gives to whomever He wants. I heard that the oil and the glitter also have healing powers. The prayer group seemed to be used to seeing this phenomenon, as they were not taking pictures or asking questions. When the prayer ended, Vassula came forward and asked if anyone wanted to ask questions about the Messages. A question and answer dialogue began and the people seemed to be very enthusiastic. The topics ranged from family and church issues to problems that occur around the world today where almost all the countries are at war. A delicious buffet followed our discussion, ending with a group photo overlooking the river. 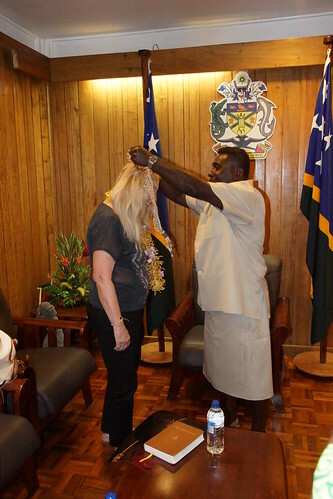 After a moving farewell from our Australian friends, we headed for the Solomon Islands. The schedule of the day was loaded. After a 3–hour journey, we began approaching towards landing on a big island partly covered by jungle, mountains and scattered small villages. At the airport, originally built by the Japanese in WW2 and newly renovated, the TLIG local group was waiting to welcome Vassula, Elaine, Shane, Mary, Suzy and Terry. As we walked out of the airport, the islanders danced for us a well-prepared ceremonial dance. Welcome with ceremonial outfits at Solomon Islands, Honiara. It was funny because out of nowhere two men jumped up with a big fake sword surrounding Vassula as if they would slaughter her. It was a welcoming dance… then a lovely little girl appeared dressed up or rather less dressed, honoring Vassula with a garland, and took her hand to lead her under a shelter where many others dressed in ceremonial outfits were going to perform tribal dances. After the ceremonial reception and folk dances with the traditional outfits, Vassula was ushered quickly to the Prime Minister’s Office, Mr. Gordon Darcey Lilo. They both exchanged welcoming gifts, with the Prime Minister giving Vassula a beautiful handmade coral necklace that he set around her neck and Vassula giving him the One Volume containing all of the TLIG messages and a copy of the Ultimate Humility’s icon that she had painted. The 30 minute discussion between them covered topics about the recent disasters that happened in the country, the Unity of the Church and the TLIG messages. Vassula told his Excellency that God had not forgotten his country and although it was number 84 on the list of countries that she has visited, God wanted her to visit his country so as to let the people know of His Divine Message. 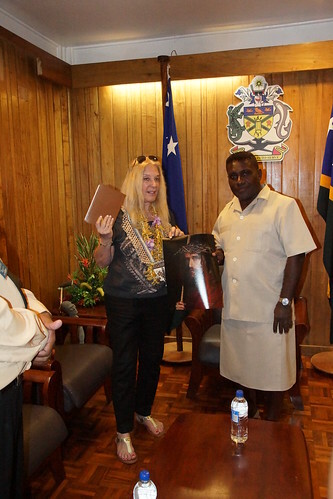 The Prime Minister highlighted that the Solomon Islands is a Christian country with God fearing people and said: “Please pray for Solomon Islands and let our people know what God wants for us and His Divine Instructions for our country”. In honor of Vassula’s visit, a journalist from the official Solomon Star News, present that day, wrote on the front page of the newspaper with a large photo saying: “Female prophet here to preach”. On the way to the hotel, we could see the full extent of the disaster by the recent tornado that destroyed houses and roads and uprooted trees. Many missing people were reported and we could notice how poverty was at a high level. We observed the islands’ surroundings and the day was free for us to assist in the preparations needed for the next meeting. Interviews with the media and news people were organised at the Mendana Hotel conference room at 10:30am. The questions from the media were very respectful, yet probing. One of the reporters asked the question: why is there so much poverty and misery in their country? Vassula answered by referring to the same question that she had asked The Father when she was in Bangladesh. She was looking out the window and seeing all the misery of the people and asked The Father to do something. He didn’t answer, but immediately asked her to pray The Our Father. He gave her the insight to understand that all the miseries can be solved by prayer. 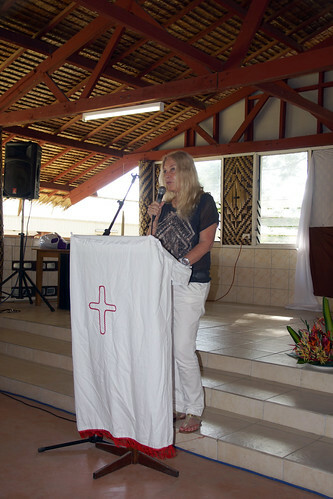 Vassula spoke of her desire for TLIG to open a Beth Myriam in Solomon Islands with the help of the Australian Association. Some questions were about her HIR (Heaven is Real But So is Hell) book. She said that the book was to attract the younger people, those not interested in anything religious, to talk to them in their language, to interest them. It is a teaser book to realize that God is reaching out. Vassula continued to talk about how she witnessed to the “others” like the Buddhists, the Hindus and an Imam and how they now come on the TLIG pilgrimages travelling together as one people. One of the reporters commented on the fact that the Solomon Islands is a Christian country, so why does it need to be converted? Vassula replied: you can always be converted more, there are no limits. You continue to climb the ladder. You can never know God enough. The messages help you to get to know God better and get close to him.” As an example of someone wanting to get closer to God, Vassula recalled a time when she met a nun of a particular order, who was living in total seclusion, not speaking and undergoing fasting. She had asked for Vassula. This nun was situated behind a screen and slipped a piece of paper underneath the screen for Vassula with the words: “Can you bless me and put your hand underneath?” Vassula did as she had asked. A moment later, the nun wrote back saying that she wanted to experience Jesus close to her; when Vassula touched her, she saw a man’s hand and felt Jesus. She had been searching for this experience for 13yrs. In the afternoon, around 2 pm., the temperature was raised a lot, it was hot and humid. We drove to reach the Office of His Excellency Reverend David Vunagi, Archbishop of Melanesia (Anglican Church). A very pleasant discussion followed on the Unity of the Church, a topic highly favored by the Archbishop. Vassula presented him the gifts of the TLIG One Volume, the prayer book and the icon of the Holy Shroud that Vassula had painted. As the heat is high at midday, the organizers had arranged that the meeting would take place after working hours, in the evening. 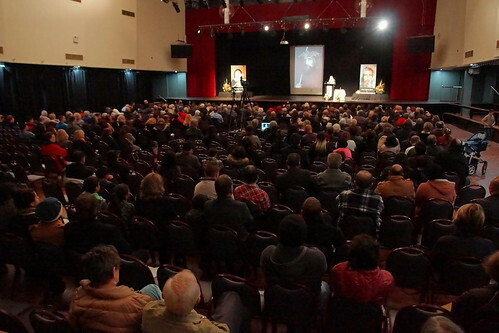 The large outdoor meeting hall hosted more than 3,000 joyful attendees. A youth choir sang inspiring hymns and praises to the Lord. The first rows were filled up with young children, around 6-8 years of age. They too were very attentive and stayed quiet the whole time, listening to Vassula. After a short presentation, Vassula spoke for almost 1 hour and 30 minutes, captivating the audience. Rain started to pour down on the tin roof making a lot of noise, but all of this seemed natural and nobody seemed bothered. The music of the large Pentecostal choir and band was loud and majestic, drawing people in from the area. Slowly the venue was filling up, including many families with children. It was an incredible blessing to see the islanders, mainly Pentecostal, receiving Vassula’s words with such enthusiasm. Whenever Vassula’s words had touched their hearts, they responded vocally and with raised hands or by clapping. It was as if the Spirit had aroused them. Vassula’s talk was very intimate, personal and soft and seemed to be moulded to the spirituality of the people. 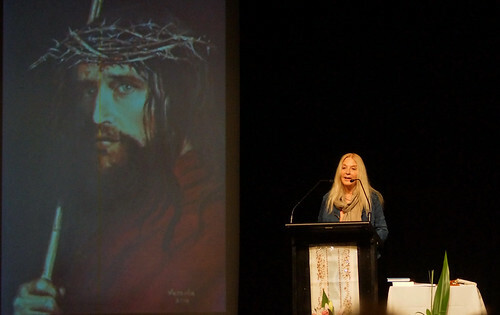 She spoke about The Father, The Holy Spirit, why God comes in this way, about intimacy, repentance and Unity. Some people said they were touched by her manner, her softness in the way she spoke. Some said that they heard through her the Lord’s love; they just knew that these words were from Him. 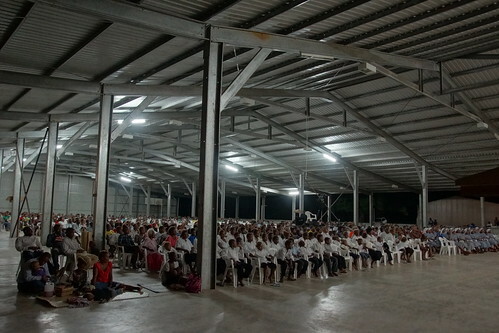 As this was the first time Vassula was invited to the Solomon Islands, this meeting was a true blessing! 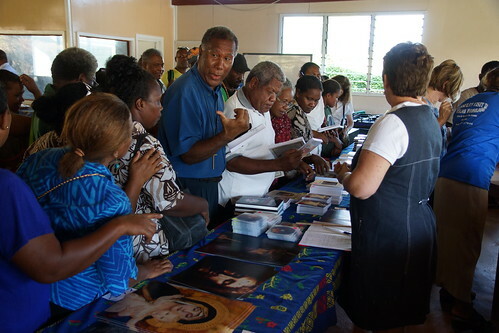 Great efforts from all members of the TLIG prayer group for this event were made possible in a miraculous way, as the Solomon Islands faced financial problems due to the recent disasters that shook these islands. Vassula was asked to have still one more meeting, but this time only clergy from different Churches and Educational representatives would be attending. 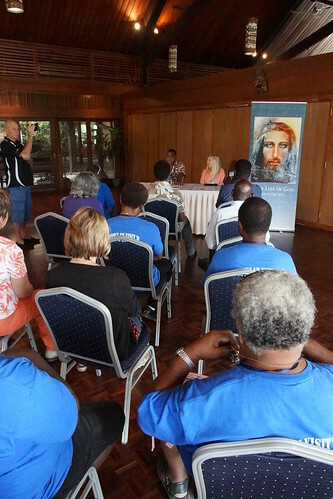 It would be a very important meeting, as this would be the every first time an ecumenical meeting would take place in the Solomon Islands. It was held on the Anglican Church premises. The Churches present where the Anglican, the Roman Catholic, the Pentecostal, the Seventh day Adventist Church and the United Church. The Orthodox Church was not present. They all came to listen to Vassula. After saying a few words about the beginning of her mission, Vassula focused especially on the practical problems that members of all churches around the world bring up about Unity. 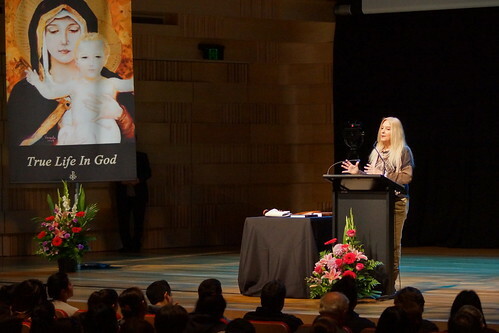 She explained that Jesus is asking for all to unite in humility and love: the keys to Unity in diversity. Vassula mentioned that the means to achieve this unity is through prayer. While continuing on the theme of Unity, Vassula related a story about that time she was asked to speak to a group, but did not know that it was a group of Voodoo Chiefs. At the end of the meeting, one of the chiefs said to her; “You have a lot of courage to speak to us!” He then asked her whether they also have the Holy Spirit. She replied that they do have the Holy Spirit, as they have the virtues of respect, charity and kindness. Q How do you see yourself, above the Church? V I see myself as inside my Church, but I have no problem with going to other churches. Q The floods in the Solomon Islands; are they a punishment from God? Q How will the Lord make Unity? V By our prayers, by making the dates of Easter the same, there will be a great flow of the Holy Spirit to lead us to Unity. Q What is your advice for the splinter churches? V Once unity comes, the splinter churches will come together like a magnet. Everyone was excited with the answers Vassula gave and at the same time surprised that Unity can so simply be achieved. Vassula ended her speech by speaking about the Pilgrimages; they are unity in action and this unity is a unity in diversity: a tangible unity. When in closing the meeting, the representative of the Community of the Christian Churches of the Solomon Islands gave a speech thanking Vassula and the TLIG group. He revealed that the Churches in the Solomon Islands were not working together and instead squabbling amongst themselves. This event has brought them together and has opened their eyes to the importance of Unity amongst themselves. The message was truly poignant for them. He also expressed the desire of all the Christian representatives present to help with the setting up of the Beth Myriam in their locality. This ecumenical meeting was a true blessing. All wanted to know more about the messages, so many TLIG books, DVDs and CDs were purchased along with the giving away of many prayer cards. 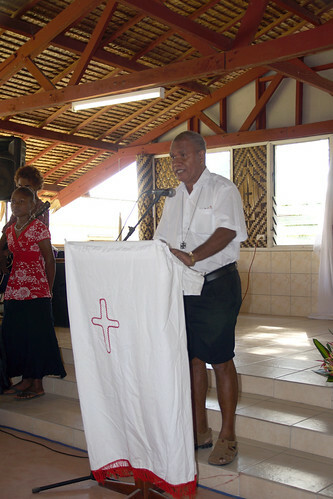 Jimmy Maeigoa, the TLIG contact person of the Solomon Islands, did his best since 2006 to spread the messages all over the island, increasing the number of prayer group members. 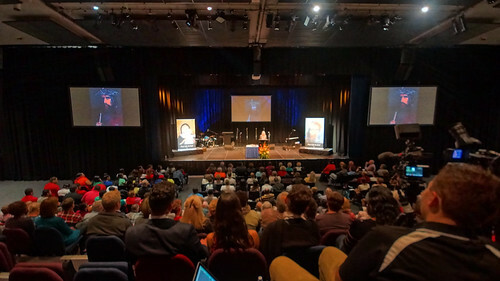 With the help of his friend Pastor Peter Kenneth and the influence of Suzy Vardanian of the Australian TLIG group, the end result could only continue to be so great! Praise the Lord! 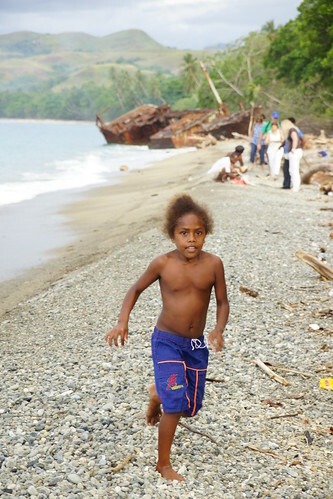 After this beautiful experience in the Solomon Islands, Vassula’s mission to these faraway lands was completed. It is an amazing opportunity to have the chance to be a witness to the blessings and graces our loving God pours over the people that open their heart to Him and welcome Him through Vassula.